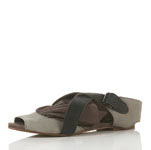 This is Topshop's "Hadley" sandal. I've been going back and forth to the site trying to decide if I should place the order. The problem.....I've never ordered anything from the U.K., and am concerned about a possible issue of some kind. I'm also considering the fact that I might need to return them if they don't fit properly and what I would have to go through to send them back, but I really, really want them.....they are so unique! I could see myself getting a great deal of wear out them, they can pretty much be worn year round. If anyone has ordered something from Topshop, please drop me a note and let me know if you experienced any problems.